Ruarigh and I are both easily lead by the new shiny thing in the store. This has lead to a rather large pile of unpainted and part painted figures. After seeing the 'Year of Frugal Gaming' blog, we decided this may not be a bad idea. Concentrating on getting one game painted up each month and played the following month. This would hopefully reduce our lead mountains, increase our bank balances, and the lead to us playing more games. For January we picked Warrior Heroes: Armies and Adventures. 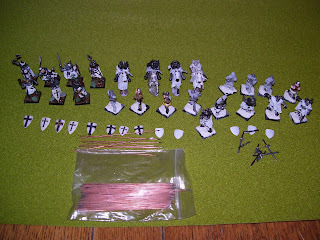 For this I will be painting 28mm Teutonic Knights and various men at arms to represent the Brethren faction. These are all Gripping Beast figures. As you can see I've already managed to finish 7 of the knights and begun quite a few more. This will be the main aim for January. My secondary objective is to paint a unit of 15mm Colonial British for a game of Space 1889: Soldiers Companion. At last. Well done, Steve. I look forward to rampaging through your ranks with my goblins, assuming I get them painted in time. No unpainted figures allowed in our February WHAA game!